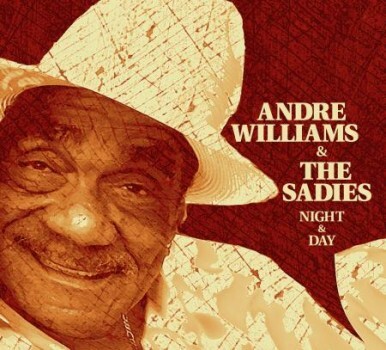 Andre Williams & The Sadies’ NIGHT & DAY available now at the Yep Roc Store on CD, 180g vinyl and digital. Canada’s finest live band, The Sadies, have reunited with explicit soul singer/cult legend Andre Williams for Night & Day on Yep Roc records. Night & Day is the result of sessions that began in 2008 at Key Club Studio in Detroit and captures Andre, then 70 years old and still using at the time, at his most raw, honest, and immediate. No filter. Andre is aided by a stellar cast of musical friends, dirty bluesers who have earned the trust of the ancient hustler, including Jon Spencer (who directed these sessions) and Matt Verta-Ray of Heavy Trash, Danny Kroha of Detroit’s own gutter-blues superheroes, The Gories, the unsinkable Mekon, Jon Langford, and of course, behind it all, The Sadies’ long-time line-up of Dallas Good on guitars and keys, his brother Travis Good on guitars and fiddle, Mike Belitsky on drums, and the mighty Sean Dean on the bass. The result is a raw, gritty slice of raunch rock that has attitude in spades and the hooks and playing to back it up. Click the player below to stream “I’ll Do Most Anything For Your Love” from Night & Day now. Click HERE to order Night & Day now on CD, 180g LP and Digital. Click below to check out the Night & Day bundles available exclusively at the Yep Roc Store and save 15% on your order! Andre Williams & The Sadies’ NIGHT & DAY out today. Stream the entire record now at AOL Spinner.